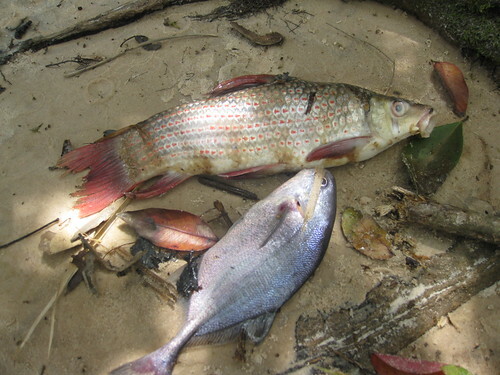 The end of August brings the lowest water levels in middle Lomami, the season when tiger fish, Hydrocynus goliath, are most in evidence. The tiger’s teeth still grimace on top of the dugout paddle. These wide-ranging, fast swimming predators continuously crisscross the river’s remaining deep pools. Based on their appearance in shallow water, and their readiness to attack almost any lure thrown at them, the pickings have become slim. Prey, abundant at high water, becomes scarce by the end of the dry season. 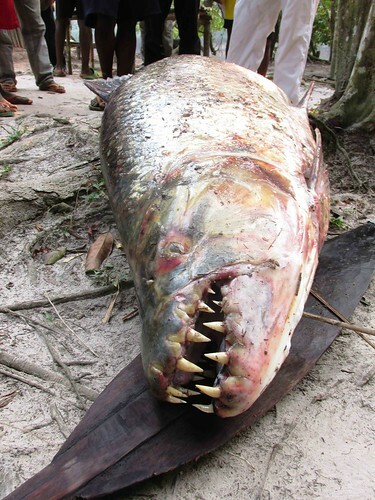 Hunger may also explain the discovery of a female tiger fish trapped in the roots of a riverside tree. 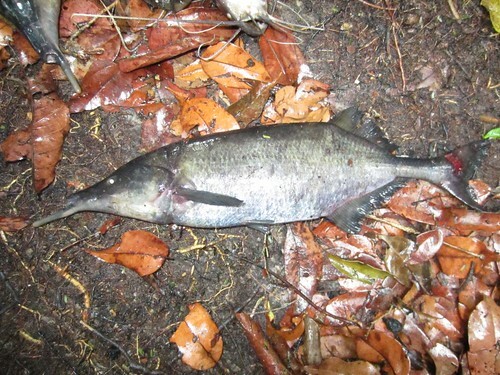 The fish, which had been dead less than 24 hours when found by a local fisherman, had swum into the maze of roots, presumably in pursuit of prey. She was apparently then unable to turn around or find her way out. Bemba hefts his side of scales. When brought in, she tipped our scales at 39 kg. She contained over 5 kg of roe. The eggs alone weighed more than most fish we catch. Tiger fish are not the only ones awaiting the return of the rains. 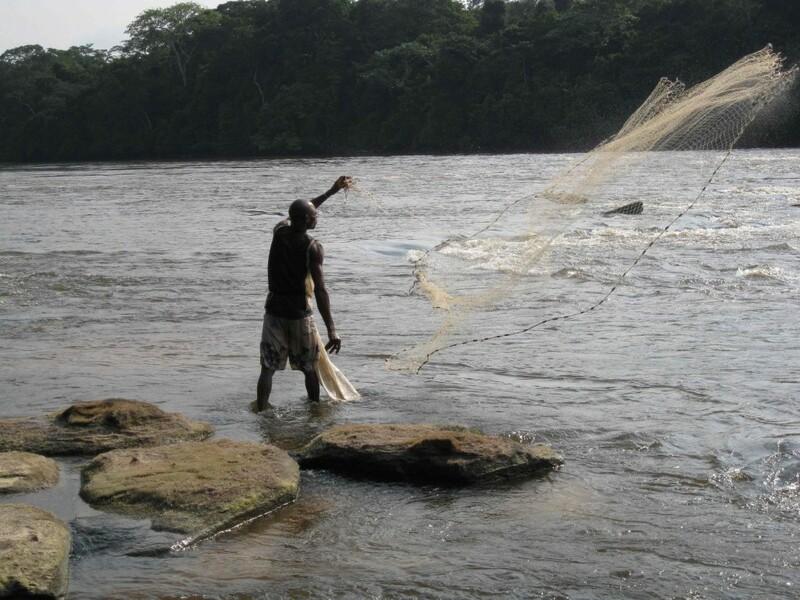 For the fishermen based at the Balinga Falls above Katopa, it is a time to prepare their traps and repair their weirs. They have fished the pools below the falls as the water dropped, but by the beginning of September there are few holes with fish remaining. Fishing Balinga’s pools at lower water. 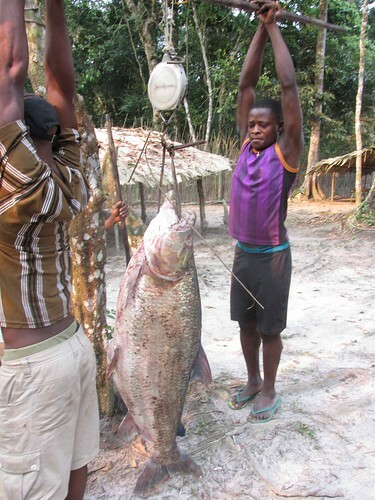 Now they are anticipating rising waters and with that the migration of fish from the Congo River, over 600 km to the north. 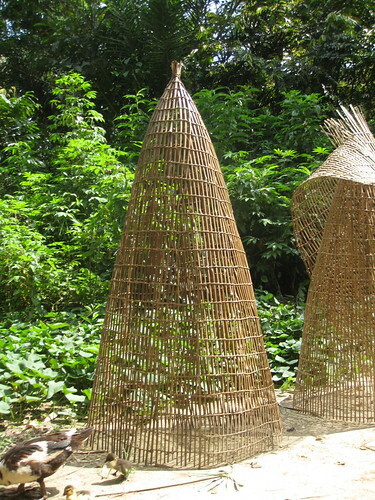 Traps are woven at the fisherman’s camp by the rapids. 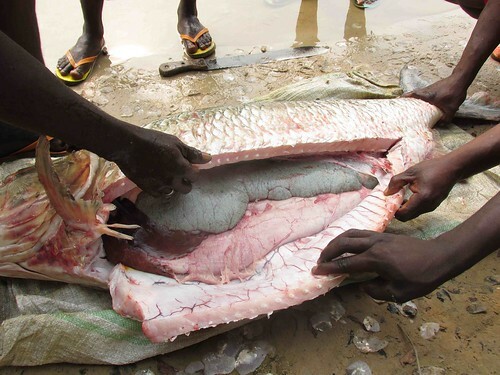 Every year, as the waters rise with the onset of the rains fish migrate from the Congo River up the Lomami into the TL2 region. The fish follow the flush of nutrients that drain from forests and savannas in tumbling floods of rain water. 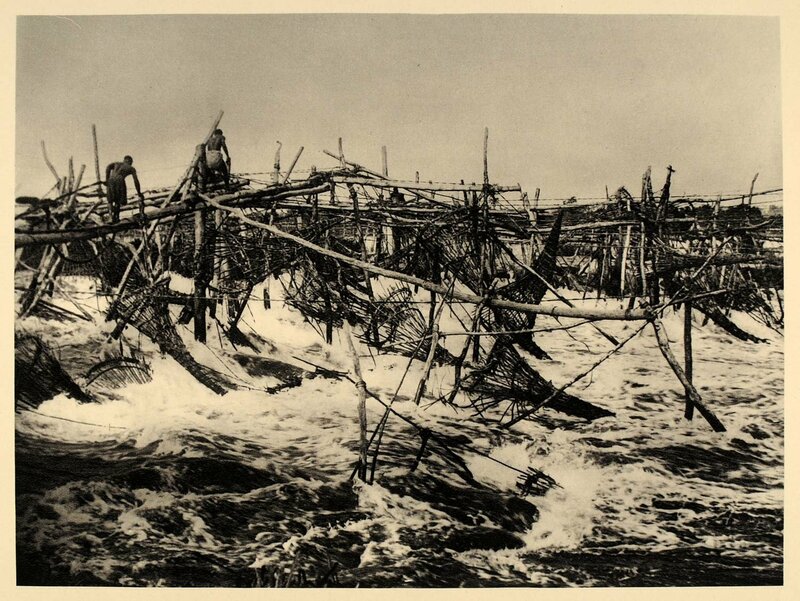 As the waters rise the fishermen place their giant buttressed traps facing down river to catch the fish as they move upstream. The Balinga Falls are a natural barrier to the migration and the fish congregate in the pools and flooded feeder creeks as the water rises. Fisherman on his weir, pulling in trap. The fishing techniques of the Balinga fishermen are unique and differ fundamentally from the fish traps of the well known Wagenya fishermen at Stanley Falls on the Congo who place their huge funnelled traps to catch fish as they are pushed downstream from above. 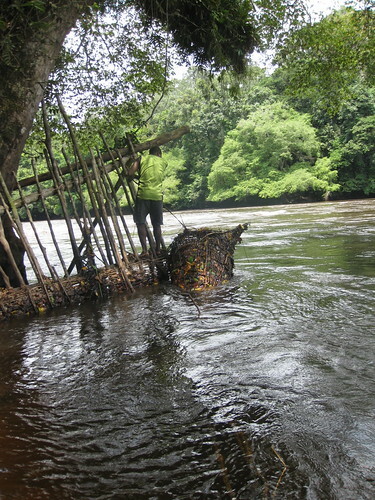 For the fishermen on the Lomami, the river’s productivity comes from the opposite direction so their traps have to catch and hold fish as they swim up against the current. I know of no other community of fishermen that has mastered the technique. The concentration of aquatic productivity below Balinga Falls has attracted a diversity of fish eating birds and mammals. This is the only area on the Lomami where we find nesting fish eagles, and where giant kingfishers are common. For these species, as with others, the seasonal patterns of breeding and migration are driven by the cyclical rise and fall of the Lomami’s waters. 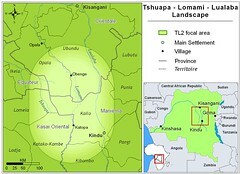 Ultimately for tiger fish and fishermen, alike, the Congo River, far away, assures the productivity of its tributary, the Lomami. 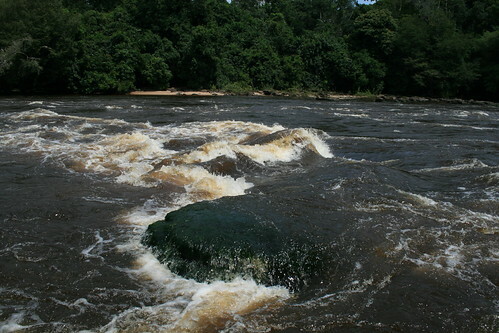 A section of the Lomami rapids at high water. This entry was written by Terese Hart, posted on 2013-09-13 at 9:49 am, filed under Lomami River, Natural History of TL2. Bookmark the permalink. Follow any comments here with the RSS feed for this post. Post a comment or leave a trackback: Trackback URL. Image 2: Labeo longipinnis (top), Cyphomyrus psittacus or possibly Pollimyrus plagiostoma (can’t see the head). Great photos, and fascinating behaviour about the tigerish. I thought that was G. echidnorhynchus, what a fantastic fish. Really nice to see pics of the biotopes there too. I will come to Congo some day, maby to “your” places.